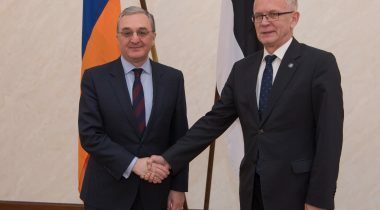 At the meeting with Minister of Foreign Affairs of Armenia Zohrab Mnatsakanyan, President of the Riigikogu (Parliament of Estonia) Eiki Nestor expressed support to the development of parliamentary democracy and carrying out the reforms necessary for that in Armenia. Nestor congratulated the Minister of Foreign Affairs of Armenia on the successful elections in December and the new parliament of the country. He expressed hope that the reform process in Armenia, that had undergone the velvet revolution, would go smoothly, and that Armenia would be able to carry out the important changes necessary for implementing democratic processes, development of the rule of law and good governance practices. “Estonia has always been a constant supporter of Armenia, and we are ready to share our experience both in conducting of reforms and in strengthening of civic society also in the future,” Nestor said. Nestor pointed out that Estonia and Armenia were united by long-time friendly relations, and cooperation in the fields of information technology and culture was an excellent example of that. He believes that the cooperation between the parliaments will contribute to new ideas and the relations between the two countries. The Minister of Foreign Affairs of Armenia gave an overview of the parliamentary elections held in December and the political situation in the country, and explained the future priorities of the state. He also spoke of the geopolitical situation in the region. The Minister of Foreign Affairs of Armenia also had a meeting with the Chairman of the European Union Affairs Committee of the Riigikogu Toomas Vitsut and member of the Committee Dmitri Dmitrijev. Armenia’s integration with Europe was discussed at the meeting. It was found that the committees of the parliaments of both countries should have closer cooperation in the European Union affairs. Vitsut expressed hope that the government that had entered into office in January would work in the name of implementing the partnership agreement between Armenia and the European Union, and that it would also be possible to start the visa dialogue with the EU. Chairman of Estonia-Armenia Parliamentary Group Hannes Hanso also met with the Minister of Foreign Affairs of Armenia today. Tomorrow, the Minister will have a meeting with the Foreign Affairs Committee of the Riigikogu, chaired by the Chairman of the Committee Marko Mihkelson and Deputy Chair Keit Pentus-Rosimannus.